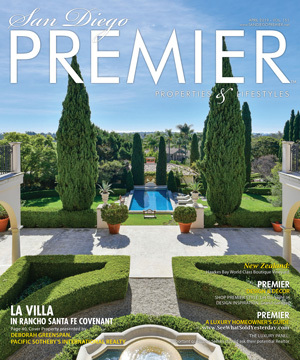 PREMIER BUSINESS & FINANCE Exploring the business of the Luxury Auction and examining the benefits they provide to both buyers and sellers. OK, so let’s talk about real estate auctions….but first, what comes to your mind when you hear the word “auction” as it applies to real estate? An auction is because the seller needs to sell at any price? An auction is a property in foreclosure? An auction is held because the seller wants to drive up the price over market value? An auction is held because the house cannot sell any other way? This is not always the case and never the case with the “Luxury Auction” run by independent auction houses. Over the next two issues we will be exploring the business of the Luxury Auction and examining the benefits they provide to both buyers and sellers. 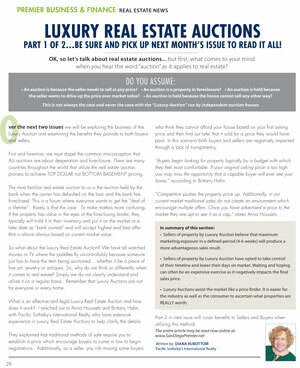 First and foremost, we must dispel the common misconception that ALL auctions are about desperation and foreclosure. There are many countries throughout the world that utilize the real estate auction process to achieve TOP DOLLAR not BOTTOM BASEMENT pricing. The most familiar real estate auction to us is the auction held by the bank when the owner has defaulted on the loan and the bank has foreclosed. This is a forum where everyone wants to get the “deal of a lifetime”. Rarely is that the case. To make matters more confusing, if the property has value in the eyes of the foreclosing lender, they typically will hold it in their inventory and put it on the market at a later date as “bank owned” and will accept highest and best offer that is almost always based on current market value. So what about the Luxury Real Estate Auction? We have all watched movies or TV where the paddles fly uncontrollably because someone just has to have the item being auctioned….whether it be a piece of fine art, jewelry or antiques. So, why do we think so differently when it comes to real estate? Simply we do not clearly understand and utilize it on a regular basis. Remember that Luxury Auctions are not for everyone or every home. What is an effective and legal Luxury Real Estate Auction and how does it work? 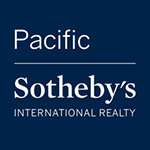 I reached out to Anna Houssels and Brittany Hahn, with Pacific Sotheby’s International Realty who have extensive experience in Luxury Real Estate Auctions to help clarify the details. They explained that traditional methods of sale require you to establish a price which encourage buyers to come in low to begin negotiations. Additionally, as a seller, you risk missing some buyers who think they cannot afford your house based on your first asking price and then find out later that it sold for a price they would have paid. In this scenario both buyers and sellers are negatively impacted through a lack of transparency. “Buyers begin looking for property logically by a budget with which they feel most comfortable. If your original asking price is too high you may miss the opportunity that a capable buyer will ever see your home,” according to Brittany Hahn. “Competition pushes the property price up. Additionally, in our current market traditional sales do not create an environment which encourage multiple offers. Once you have advertised a price to the market they are apt to see it as a cap,” states Anna Houssels. Sellers of property by Luxury Auction believe that maximum marketing exposure in a defined period (4-6 weeks) will produce a more advantageous sales result. Sellers of property by Luxury Auction have opted to take control of their timeline and lower their days on market. Waiting and hoping can often be an expensive exercise as it negatively impacts the final sales price. Luxury Auctions assist the market like a price finder. It is easier for the industry as well as the consumer to ascertain what properties are REALLY worth. Auction targets a wider range of buyers from the lower and the higher ranges of your property’s value. Keeps the pressure on the buyers to make a decision as there is a deadline. Buyers must perform all due diligence and waive all contingencies before submitting offers. Intensive marketing focused on your property both through private database, local market and international resources will be key. Reduces time on market. The longer that property sits on the market after 60 days, statistically, the price begins to decline regardless of market conditions as the market views it as “stale” or “overpriced”. Avoid long time on the market and hefty cost of carrying. i.e. the cost of your mortgage, taxes, maintenance, insurance, etc. In areas where there is a lot of inventory or inventory is stagnant, it helps your property to stand out. Buyers understand you to be a committed seller and not testing the market. The more unique the property the more it benefits from maximum exposure to relevant and qualified buyers. Forces a competitive market which encourages multiple offers. You can feel confident that the “best buyer” is found and not just any buyer interested in purchasing who may not actually take the transaction all the way through to close of escrow. Transparency – you are not relying on agent’s anticipation of price and value but on actual buyer’s level of financial interest. Therefore you do not need to fear “overpaying” as you are aware of what the market is prepared to pay. On the Auction floor the sellers are ready to sell their property. Strong purchasers don’t have to wait for the auction as they can buy now. Auction house provides independent professional inspections for the property for the buyers to review, at no cost. No surprises! Generally, auction properties have committed sellers who are looking to sell, no testing of the market. Normal loan options exist…you do not need “all cash”. In conclusion, it is important to remember that real estate auctions are not for everyone or for every property. But they can be a very effective resource if you truly understand the process and have reasonable expectations. Depending upon your property value and the uniqueness of your property, an independent auction house working alongside your Realtor® may be the preferred option with the largest upside.